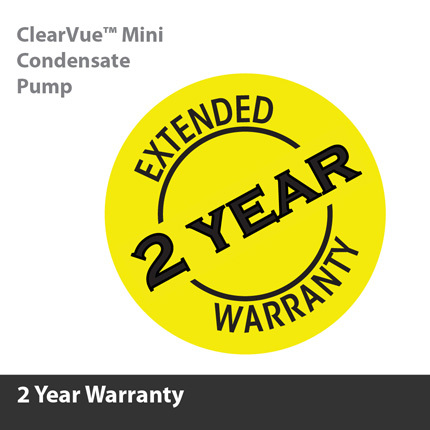 ClearVue™ Mini has a dependable, extended 2 year warranty. 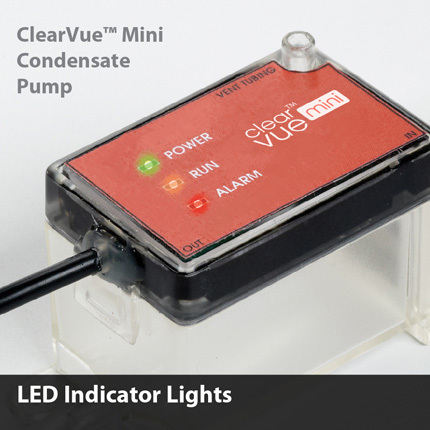 ClearVue™ Mini features three LED indicator lights: Ready, Pumping, and Alarm. The LED lights tell you what mode the pump is in at any given time. 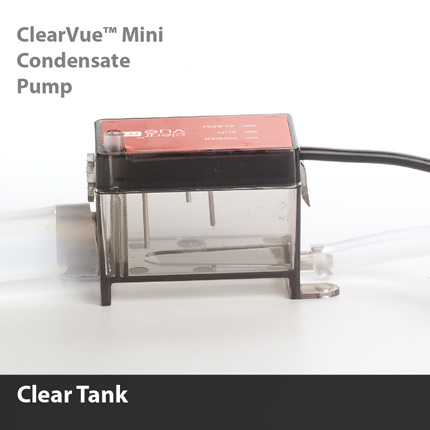 The clear tank feature of ClearVue™ Mini allows the user to see the activities inside allowing for faster and accurate troubleshooting. 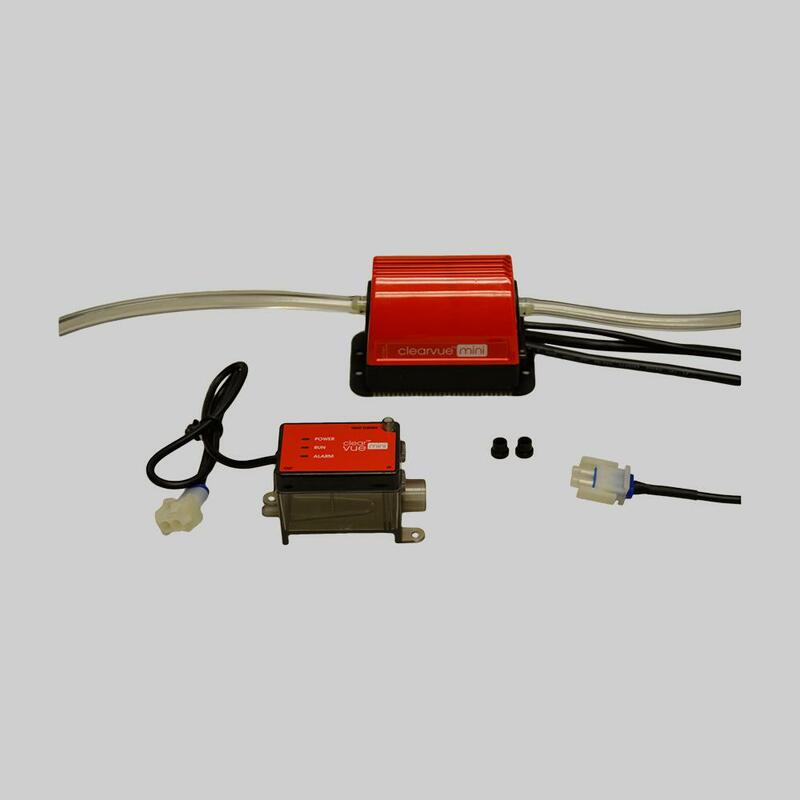 Electromechanical float switches used in conventional condensate pumps are prone to mechanical failure including debris fouling, sunken floats, and misalignment. 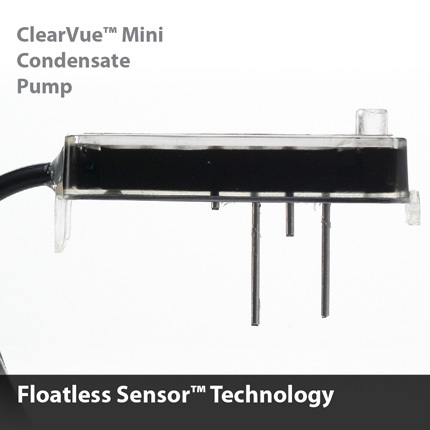 ClearVue Mini's Floatless Sensor™ eliminates the problems associated with conventional condensate pumps. No float, no problem. 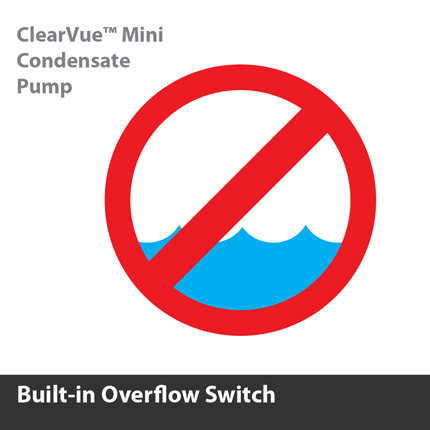 ClearVue™ Mini is compact - only 3-1/2" x 2" x 3". It fits almost anywhere including inside a line set cover, inside the wall cassette unit (on some cassette models), and easily installs in ceiling or behind a wall. 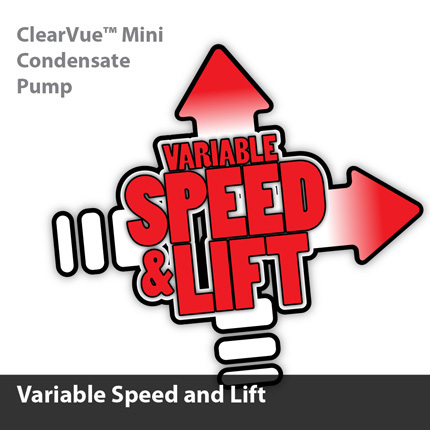 ClearVue™ Mini features suction lift of up to 6 feet. 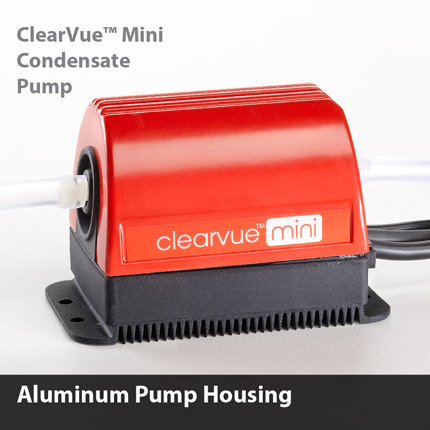 ClearVue™ Mini features an aluminum housing that is built to last. 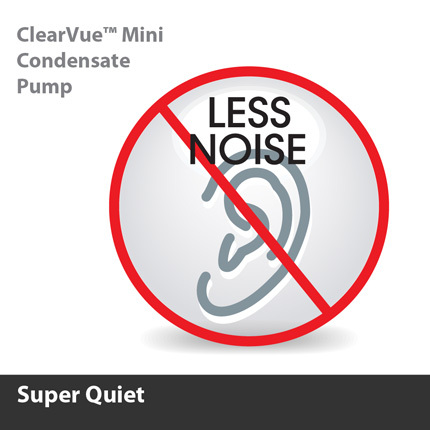 This aluminum protects the pump from physical damage, and helps contribute to the super quiet operation of the pump. 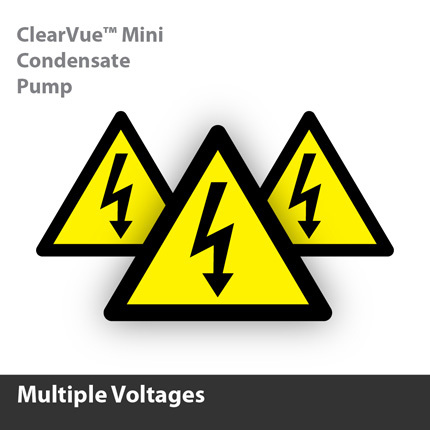 ClearVue™ Mini can be powered with any voltage from 120 to 240V, 50 or 60 Hz. With one product suitable for multiple voltages, there is no need to stock separate SKUs for different voltages. 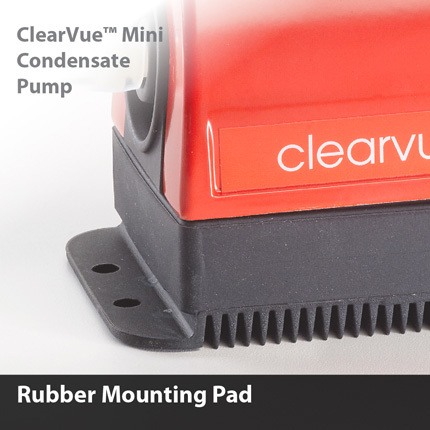 The molded rubber mounting pad can be used to mount ClearVue™ Mini to a vertical or horizontal surface; or to copper refrigerant lines with cable ties. The rubber pad decreases sound and vibration, contributing to a very quiet pump. 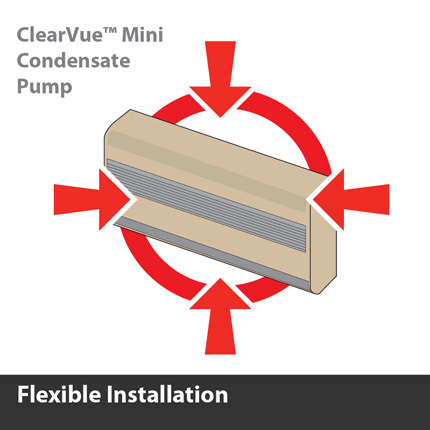 Tank can be located away from pump if needed, allowing for flexible installation. The small tank fits inside most indoor cassettes. ClearVue™ Mini is nearly inaudible. The sound rating is significantly less than 20 dB. You literally can hardly hear the pump run. 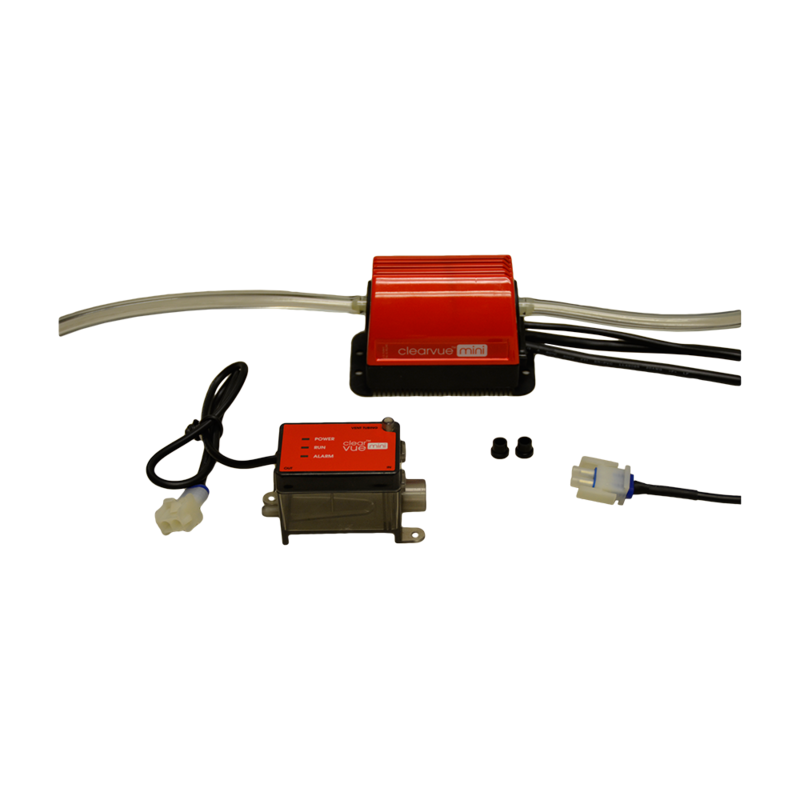 This quiet operation allows maximum installation flexibility, as you can place the pump right in the room with the wall cassette. Shuts down the compressor in case of a clogged line, preventing damage to equipment or environment. 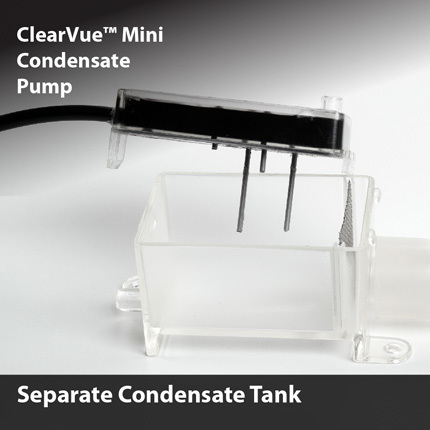 ClearVue™ Mini determines how fast condensate is entering the tank and adjusts its speed and lift to match the conditions and keep the tank clear.